Here is another page to help you out with organizing your daily life. This is just another glossary packed with wisdom in the midst of the pages that these authors have put their time and great wealth of experience into all of their writings. In this very mom friendly book “Secrets of An Organized Mom,” Barbara Reich literally touches every aspect, every piece, every square foot of the house so that nothing can be left for interpretation and you can walk away from this book ready to conquer every part of your daily life. With great/creative titles for each chapter, Reich is sure to be able to draw you in with facts, practicals and fun. Reich really pushes in this book with an agenda to help the mom who feels like she has it all on her shoulders, but wants to be a time and organizational pro. 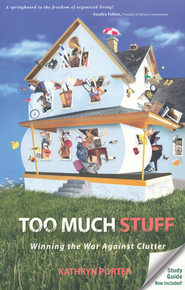 Delving deep into the the physical and psychological effects of a cluttered home, author Kathryn Porter hits on the importance of having a clutter free home in her book “Too Much Stuff: Winning the War Against Clutter.” For those struggling with too much clutter and not knowing how to get rid of it, then this is the book for you. Porter gives you practical and peaceful steps on how to get clutter out of your life and clear your mind and your space you live in. Kathryn goes after the enemy that is clutter. She leaves no stone unturned (or kept around b/c that’s clutter) and charges into this subject that can leave us breathless, restless and frustrated. Strewn throughout the book is a plethora of encouraging ways to get rid of clutter and get your life back in order. This book is here to help you fight and win the battle and the war of a cluttered life and turn it into a decluttered life. Can you really get your house clutter-free in 5 days? Well, Sandra Felton and Marsha Sims have found quick and easy ways to get this done and to maintain and manage a clutter-free house in days to come. 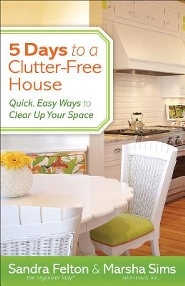 In their book, “5 Days to a Clutter-free House: Quick, Easy Ways to Clear Up Your Space,” Felton and Sims help manage your daily life so you can have a de-cluttered house in just a simple 5 days. So many great books are being put out there today about organization and the plethora of methods that can go into how one can clean their house. 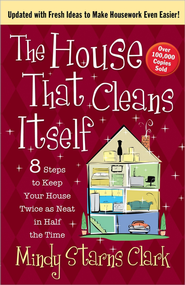 This is another one of those books that goes deep in a certain method of "adapting to your house" so that you can clean and organize most efficiently and get your house and life back together. In "The House that Cleans Itself," they tackle the "rule" that you must conform to established house cleaning rules, but actually you can adapt to your house and clean according to the needs of your house. Talk about mind-shift! With great ideas such as, think like a hotel and putting God first, this book is bound to bring you wisdom with how to go from messed to blessed. Go check it out!